The pace of job growth in the U.S. economy has increased in 2014 relative to the preceding years, and consensus forecasts suggest that this more rapid trend will continue. Job growth has averaged 230,000 a month thus far in 2014, as compared to 196,000 and 183,000, respectively, in the first seven months of 2013 and 2012. Unfortunately, at that rate it will still take over three years to return to pre-recession labor market conditions, but clearly it is a move in the right direction. Wage growth, on the other hand, has been uniformly dismal essentially throughout the recovery from the Great Recession. A report we released last week showed that real (inflation adjusted) wages in the first half of 2014 were down over the year across nearly all parts of the wage distribution and across all education levels. One measure we’ll be looking at more closely tomorrow—in large part because it bears so heavily on Federal Reserve policy in coming months—is the pace of nominal wage growth. Despite fears from some inflation hawks, the fact is that the weak labor market of the last seven years has put enormous downward pressure on wages, and there has been no significant pickup in nominal wage growth in recent years. Employers just don’t have to offer big wage increases to get and keep the workers they need, when hiring rates and net job creation remain far slower than what’s needed to generate healthy labor market outcomes. The result is that over the last year slow nominal wage growth, and inflation-adjusted wage stagnation (or even outright declines), have continued. 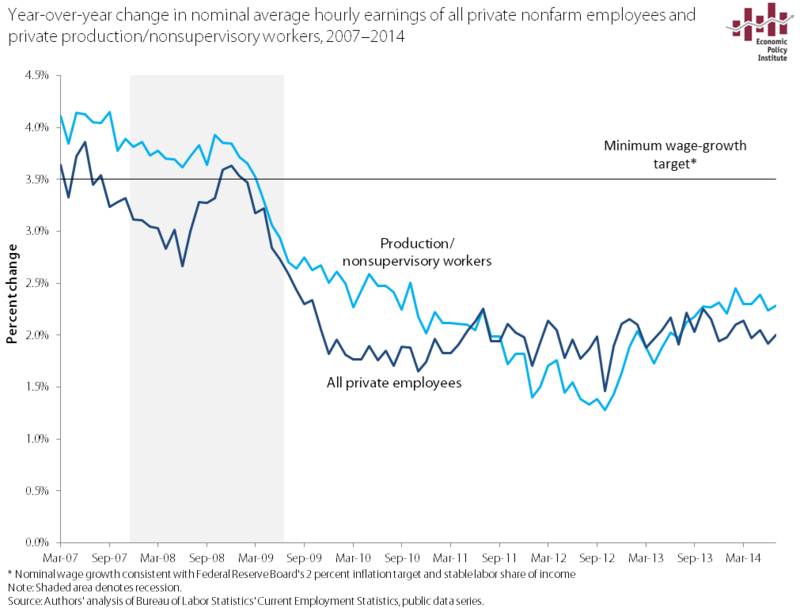 In the figure below, we show nominal average hourly earnings for both all private workers and for private production/nonsupervisory workers from 2007 to 2014. It’s clear that nominal wage growth has been flat for a long time, and there’s little evidence this flatness has changed in recent months. It’s important as well to realize that recent nominal wage growth around 2 percent is far too slow even if one accepts the Fed’s 2 percent target for price inflation. This is because nominal wage growth has to be adjusted by the overall rate of productivity growth to assess the upward pressure it puts on overall prices. So, if wages rise 2 percent and productivity rises 2 percent, then unit labor costs—the pressure on prices that is imposed by labor markets—will be flat. And this, by the way, is exactly what unit labor costs were in the 2nd quarter of this year, as reported today by the BLS. So, if trend productivity growth is conservatively estimated at 1.5 percent per year, this means that nominal wage growth of less than 3.5 percent is actually too slow for the Fed’s inflation target. Further, given that today’s profit margins are historically large, there’s a good argument to be made that nominal wage growth of greater than 3.5 percent for a time is appropriate. In every post-war recession, profit margins and shares rise in the early stages of recovery than fall back as labor markets tighten up. It is far from clear that we’ve even reached the point where the rising profit share has stabilized, let alone started to give space for wages to claim a larger share. So, in the end, we really could have nominal wage growth about double what we’re seeing today, before even a Fed focused on a 2 percent price target should think about tightening. In the figure below, the horizontal line represents 3.5 percent—nominal wage growth consistent with the Federal Reserve Board’s 2 percent inflation target and a stable labor share of income (given 1.5 percent trend productivity growth). We need to see consistent wage growth above this line before there is a hint of upward pressure on prices stemming from too-tight labor markets. And in truth the economy (and workers in it!) could benefit from consistent wage growth that was significantly higher for time, which would help workers claw back some of the productivity gains that have failed to translate into wage gains.